I would like to share with you another of the projects I made for the launch of the Starlight Waxes – a nautical themed crate. 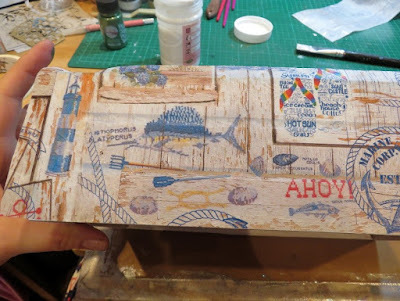 My first step was to cover the whole crate in a coat of White Gesso and once this was dry, paint the ends of the crate with Baltic Blue MDF Paint. I wanted to add some detail to the ends of the crate, so reached for some of the Art-Cutz. Not wanting to use loads all at once, I decided to turn the ‘waste’ part of the Art-Cutz into a stencil! 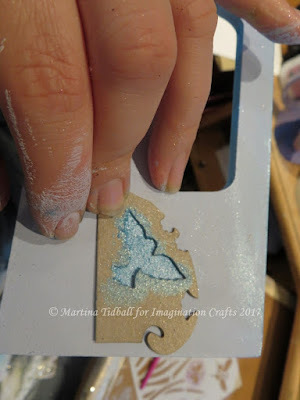 I used Mediterranean Sky Starlight Wax and a Stencil Brush to stipple birds all over the sides of the crate; the wax went perfectly with the Baltic Blue to make a gentle contrast. I also added wax to the top edges of the box and the inside of the handles to tie it all together. I still wanted to add something more to the edges, so I decided to use a little of the gorgeous new Diamond Blue Sparkle Medium. Taking just the border from the one of the word stencils featured in the Hochanda shows, I added a small ‘frame’ to each end. 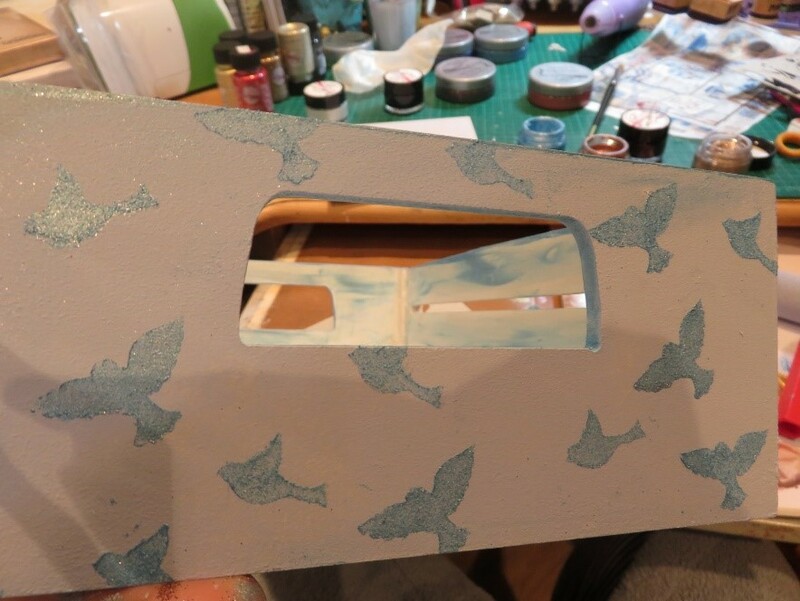 To decorate the sides, I used Magi-Bond Decoupage Glue and some of the beautiful Rice Paper Pattern 337. I used two sheets in all to decorate the whole crate, even though each crate side was longer than A4. 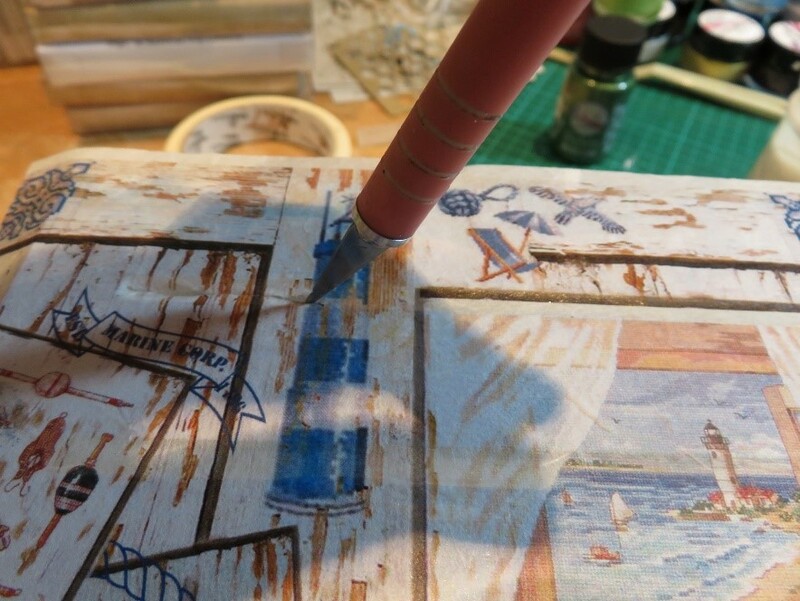 The paper allows you to cut or tear into it and then overlay, or add, to extend the pattern (see below – can you see the join?!). With the cuts nice and even, I used more of the glue and pushed the paper inwards with a thin nail file. Once all was dry, I decided to paint a small strip of the Bird Art-Cutz with Sax Blue Starlight Paint to break up the images on the side of the box and add another layer of interest. The final touch - some ribbon from my stash and all done! Thank you for reading, I hope you like the finished crate! Most of the products I have used are still on the Imagination Crafts Website, the crates and the MDF Paint are still available from Hochanda at the moment, if you’re quick! 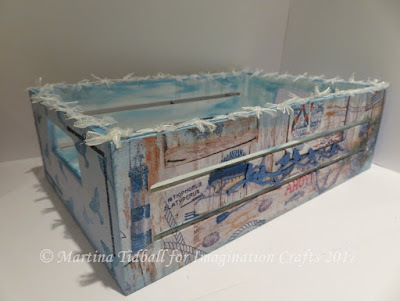 A great idea for brightening up a wooden crate. Thank you for visiting the blog & taking the time to leave a comment, we read them all & appreciate every one.